Dear readers, this blog is moving out from wordpress.com to a new location. The new address is http://bc.bojanorama.pl. Please update your bookmarks. It turned out that I wrote the last post on “intergraph” package too hastily. After some feedback from CRAN maintainers and deliberation I decided to release the updated version of the “intergraph” package under the original name (so no new package “intergraph0”) with version number 1.2. This version relies on legacy “igraph” version 0.5, which is now called “igraph0”. Package “intergraph” 1.2 is now available on CRAN. Meanwhile, I’m working on new version of “intergraph”, scheduled to be ver. 1.3, which will rely on new version 0.6 of “igraph”. I am sorry for the mess. On June 17 a new version (0.6) of package “igraph” was released. 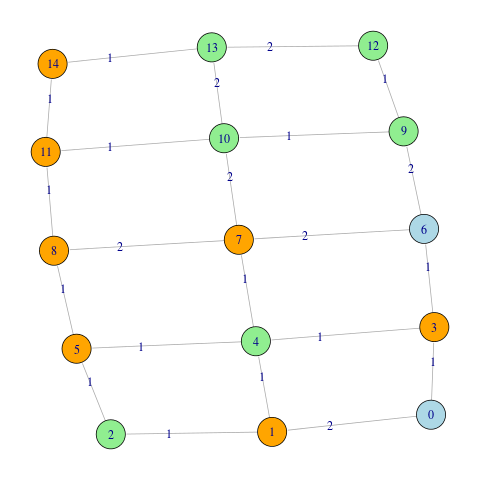 This new version abandoned the old way of indexing graph vertices with consecutive numbers starting from 0. The new version now numbers the vertices starting from 1, which is more consistent with the general R convention of indexing vectors, matrices, etc. Because this change is not backward-compatible, there is now a separate package called “igraph0” which still uses the old 0-convention. These changes affect the package “intergraph“. A new version of “intergraph” (ver 1.3) is being developed to be compatible with the new “igraph” 0.6. Until it is ready, there is now package “intergraph” version 1.2 available on CRAN, which still uses the old 0-convention. It relies on legacy version of “igraph” (version 0.5, now called “igraph0” on CRAN). If you have code that still uses the old version of “igraph” (earlier than 0.6) you should load package “igraph0” instead of “igraph”, and use package “intergraph” version 1.2. If you already started using the new version of “igraph” (0.6 or later), unfortunately you have to wait until a new version of “intergraph” (1.3) is released. As I wrote in the next post, in the end there is no package “intergraph0”, just the new version 1.2. Consequently, I have edited the description above. 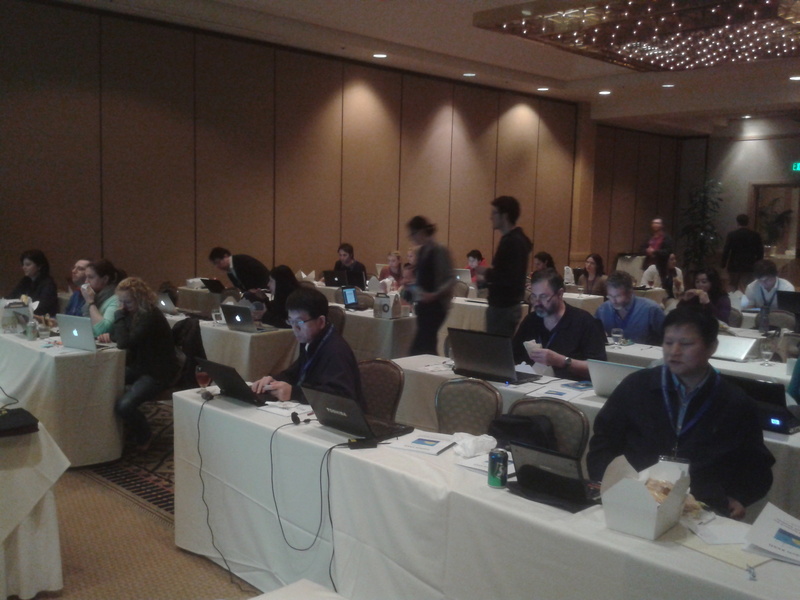 I am currently in Redondo Beach, CA at the Sunbelt XXXII social networks conference. The program is thick from numerous interesting talks so the event promises to be very interesting. 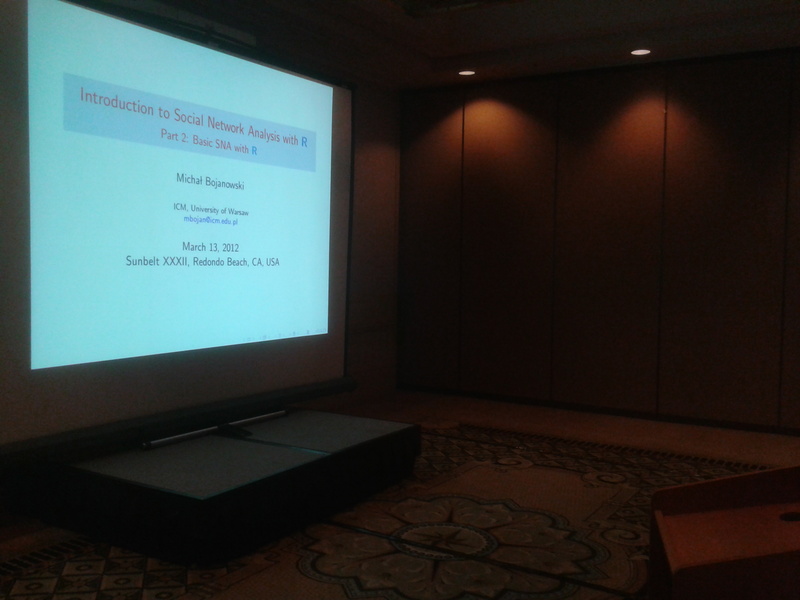 Today in the morning I gave the workshop “Introduction to Social Network Analysis with R”. Over 50 people registered. I am grateful to all the participants for attendance. I hope the workshop was useful to you, despite some of the technical difficulties in the beginning! I just released the first official version of the ‘intergraph’ R package. With the functions provided in the current version (1.1-0) you can convert network data objects between classes ‘igraph’ and ‘network’. 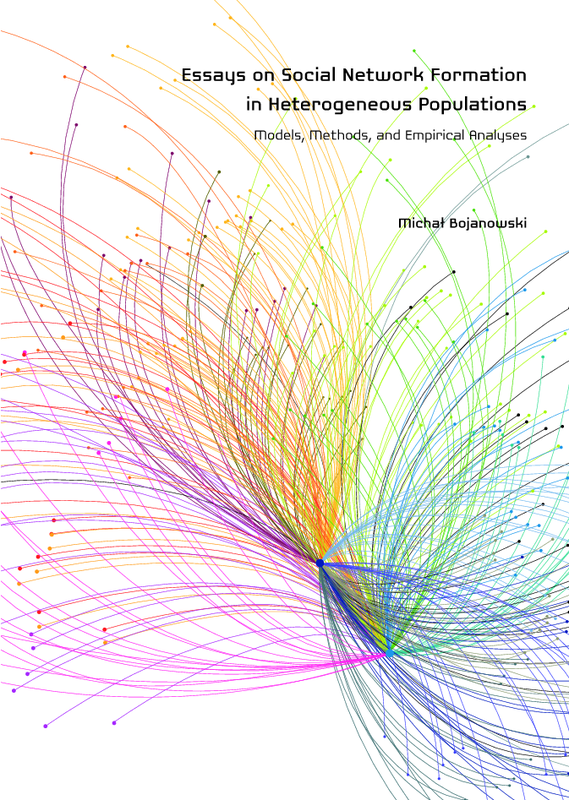 The package supports directed and undirected networks, and handles the node, tie, and network (graph) attributes. Mutliplex networks (i.e., with possibly multiple ties per dyad) are also supported, although not thoroughly tested. Network objects of class ‘network’ (from package “network”) can be used to store hypergraphs. Conversion of these is not supported at this time. Both ‘igraph’ and ‘network’ classes can be used to explicitly deal with bipartite networks. Currently, for the bipartite networks, only the conversion from ‘igraph’ to ‘network’ will work. I hope to be able to add the conversion in the other direction in future releases. You can download and install the package from CRAN. The package sources are hosted on R-Forge here. I was wondering if anyone knew of a script or tool which would give me the network distance of nodes to a particular class of nodes. I think of this as an Erdos number, except instead of getting the distance to one node, I want the distance to the closest node of a particular class. Let’s say I have a network of people and I know their professions. Some are Students, some are Journalists and a small number are Engineers. I’d like to be able to find out the network distance of each node to the closest Engineer node. It would be particularly useful if the script also had the option to total edge weight into the calculation. It assumes that ‘g’ is a network (object of class ‘igraph’), ‘aname’ is a name of the node attribute, ‘avalue’ is the value of the attribute ‘aname’ that designates the nodes to/from which we would like to calculate distances, finally ‘weights’ can be optionally used to include weights in the calculation (as a numeric vector). The function will return a vector of distances in ‘g’ from all the nodes to the closest node that have a value ‘avalue’ on attribute ‘aname’. As an example consider the network below. It is undirected and has 15 nodes. It has two attributes defined: a node attribute called “color” having values “orange”, “lightblue”, and “lightgreen”, and an edge attribute called “w” with values 1 or 2. Both attributes are shown in the picture as a node color and edge label. The numbers on the nodes are node ids. In the result vector you will get 0s for the nodes of specified type, i.e. in the last example there are 0s for the “lightblue” nodes. If a certain node is not connected (directly or via other nodes) to any node of specified type the vector will contain ‘Inf’ (plus infinity). The algorithm will not accept negative weights. But this limitation can be effectively dodged by transforming the weights so that they are all positive (for example adding some number), performing the computation, and then transforming back the results to the original scale. You can exploit other features of ‘shortest.paths’ function, on which this function is based. Any extra arguments to ‘spnt’ are passed to ‘shortest.paths’. For example, if the network is directed you can calculate shortest paths that are either incoming, or outgoing (via ‘mode’ argument). See help page of ‘shortest.paths’.